Long thought to be unique to the Baltic region, amber--fossilized tree sap, often bearing the remains of ancient plants and animals--is widely distributed throughout the world. Here entomologists George and Roberta Poinar take readers on a tour of one out-of-the-way amber bed, located in the rainforest of the Dominican Republic, that formed over a period between 45 and 15 million years ago. This particular amber, formed mostly from the pungent sap of the algarrobo tree, attracted many curious creatures, including stingless bees and scorpions, as well as bits and pieces of material that happened to be floating by: hairs from a long-extinct Antillean rhinoceros and a saber-toothed tiger, spider webs, and seeds from plants that now take on slightly different forms. The Poinars' findings show that the prehistoric Antilles region, formed from large-scale volcanic and tectonic events, has declined in biodiversity, and they help give a more complete picture of the ancient climate than has hitherto been available. Poinar and Poinar have created a fascinating scientific work with their reconstruction of what the forest of that epoch looked like. Using the thousands of examples of plants, seeds, petals, leaves, pollen, insects, and frogs or lizards that fell into the tree sap and were preserved like time capsules, they describe the ancient jungle long before any man trod this earth. This is a fine book and will be used for many, many years as 'the' reference book on amber. 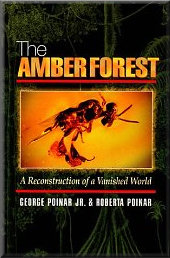 Enjoy this magnificent reference book on amber and the insects that are found there. This is getting harder and harder to even find the hard back book, but we carry it here at Amberica West.